We have passed this restaurant a thousand times and often said, perhaps not too seriously, we must try that some time. But when our intended eating place turned out not to be serving food on a Saturday night, we thought we might actually give it a go. It lies in the group of shops just opposite the barrier block, nestled between the fast food outlets and the small grocers that stay open all hours. This is not a trendy restaurant in Brixton Village and being relatively early on a Saturday night, would be unlikely to attract a crowd. The entrance is also rather forbidding. Inside is so dark you can’t tell whether there is anyone there. But it said open by the door, so we ventured inside – through two sets of doors. There were two tables with customers and the Costa Rica versus Uruguay match on the TV. It is still lacked light inside and with the dark décor it was hard to see anything until your eyes adjust. Each table has a vase of small yellow artificial flowers and salt and pepper containers with little tomato tops as decoration. There are two rooms, a large one at the back and a smaller one with the TV, bar and customers, so we chose to sit and be convivial. 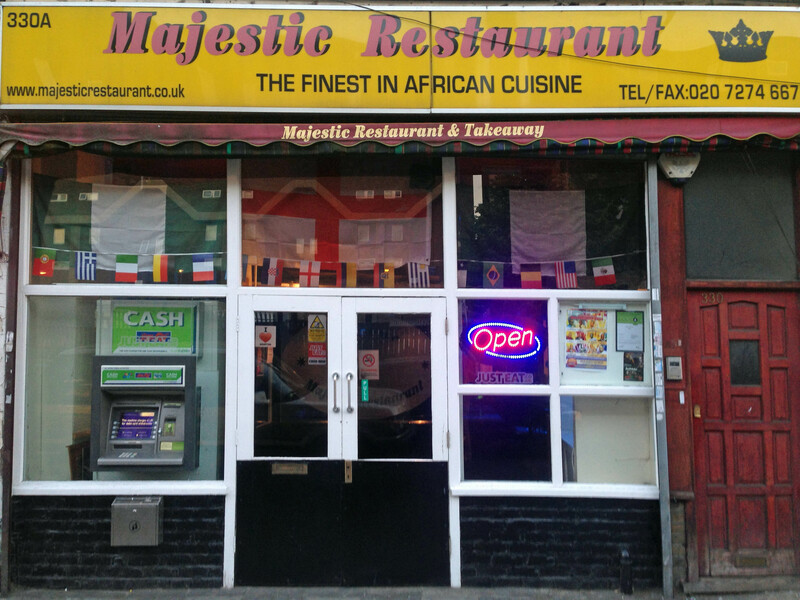 It describes itself as African but we think it is mainly Nigerian. That too poses some problems as there are names of dishes had little by way of description, so what you are going to get is a bit of a lottery. The waiter wasn’t much help, saying merely “that one is fried fish”, which we already knew. But they do make it easy to choose. First you choose the carbohydrate, from eba (who knows we got no explanation but it seems to be made from cassava flour), pounded yams, amala (made from yam or cassava flour according to Wikipedia) and ground rice. Then there is the vegetable (for example okra, spinach or spinach with egusi) and finally the protein (beef, goat, chicken, fish or “assorted meat” where one ingredient is cow’s foot). They also have vegetarian options as well as specialities, many of which involve plantain. We decided we didn’t need a starter, despite the draw of fried gizzard, fried snail or goat pepper soup. 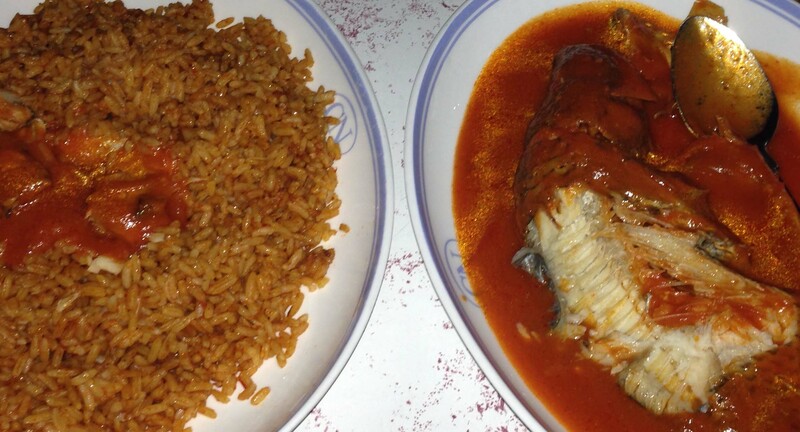 We chose Jollof rice with tilapia and eba, with spinach and egosi and a hefty portion of chicken. It is possible to eat with your fingers as you can in other African restaurants but it is not expected and we didn’t see anyone offered a bowl of water. We were pleased about this as it is intimidating and you do feel a bit of a failure resorting to the traditional knife, fork and spoon. The food is all spicy but not so much that it is impossible to eat although I did have a hanky to hand. The eba looks like a lovely mound of mashed potato and, unlike the visually similar banku (Ghanian), is not fermented and to my taste that’s preferable. It is, however, a large mound and there was no way anyone would leave hungry. There was also a lot of chicken although the darkness made it more difficult to dissect. The spinach and egosi was really good and a foil for the spicy sauce. The jollof was like a spicy paella, well flavoured with different kinds of peppers and tomato. The fish was huge, filling the plate and covered in a red sauce. I thought this might prove to be a problem, given the gloom surrounding us, but it proved much easier than we thought as the fish slid off the bone with no mishaps. We do not know if there were desserts – we were too full. We washed it all down with a large bottle of beer between the two of us and it looked like we were the only ones drinking alcohol. This is despite a long list of alcoholic drinks including a choice of wines, all priced at £15.00, apart from very expensive champagne including one at £120. Clearly they are expecting some big spenders. The total bill came to £23.00. They do not expect a tip and were anxious to give us the change as we left. We would definitely suggest this restaurant to the intrepid diner who is wants a change from what’s on offer in the Markets and some authentic and hearty food.